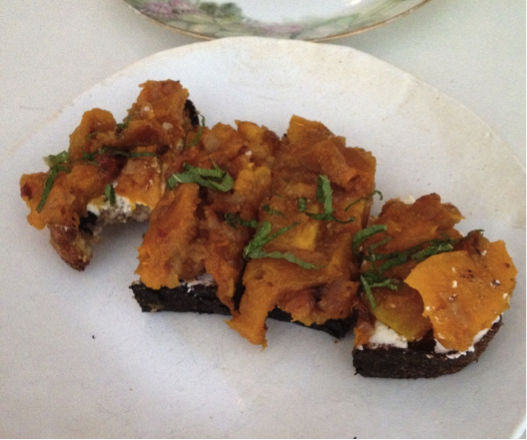 One of my top 5 favorite dishes in NYC is the roasted kabocha squash toast at ABC Kitchen. It might even be number 1 – it’s that good. I have been known to go sit at the bar alone and order squash toast. The flavor is just unbelievable – the toasty olive oil soaked bread is spread with creamy ricotta, and then topped with the magical squash mixture. It is sweet, salty, and spicy all at the same time. The fresh mint on top adds a beautiful pop of green and a fresh finish. The first time I introduced the dish to my husband, he insisted that we only needed one order. He was obviously wrong, and we had to order a second one to come out with dinner. It is seriously that good! On a recent visit, I was lamenting the fact that this restaurant is not in our neighborhood. 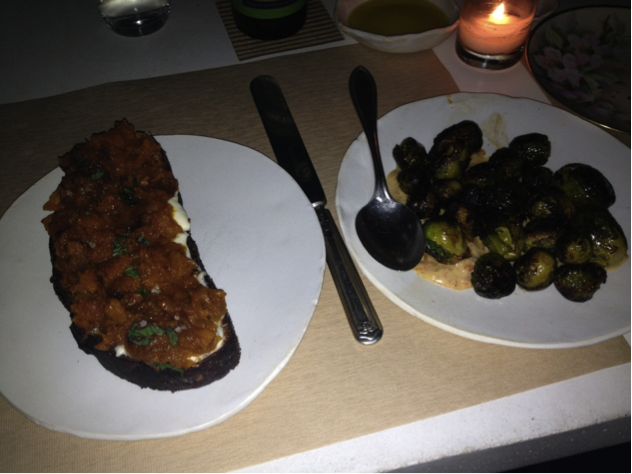 If it was, I would go all the time just to sit at the bar and get the squash toast. I would become a regular, and they would call me squash toast girl. Strange goal, I know, but I think it would be awesome to be known as squash toast girl. This dish is seasonal, so go try it soon to avoid disappointment. I have not yet tried to make it, because I fear it will not be as good as the original. Here it is again. Perfection every time. And again. Those Brussels sprouts were pretty darn tasty too. Notes from the husband: My wife’s review of the Squash Toast at ABC Kitchen may seem over the top, but honestly, if anything she is understating her love affair with this dish. Her desire to be known as the Squash Toast Girl is, sadly, very real, and is quickly becoming one of the main reasons why I’d be hesitant to move Downtown. As for the dish itself, it’s truly great. I may tease my wife about it – but I never complain about “having to” order a separate portion for myself. 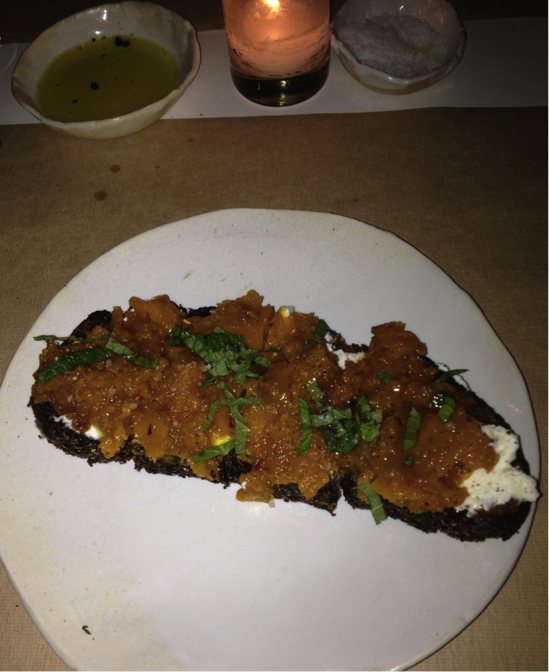 While in general my experiences at ABC Kitchen have been a little ‘hit or miss,’ the squash toast alone is a reason to check it out. O-M-G. This is my favorite post and my mouth is watering! Both of your comments crack me up. It is gone until fall, I’m crushed!